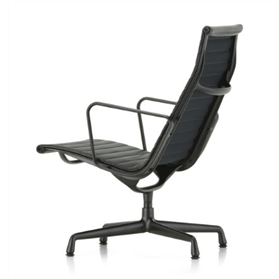 The Aluminium Chairs EA 115 and EA 116 by Charles and Ray Eames are lounge chairs that offer an inviting and comfortable place to relax for extended periods, thanks to the high backrest. The seat is not particularly low and is easy to rise from, which makes these chairs especially well suited for lobbies and waiting areas. They are available with fabric, leather or mesh fabric covers in a selection of colours. EA 116 has a swivel seat while EA 115 has a fixed base.